Coverage:Live on BBC Two, Red Button, Radio 5 live sports extra, online, tablets, mobiles and BBC Sport app. 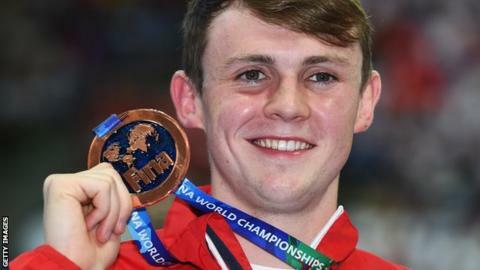 Commonwealth Games gold medallist Ross Murdoch won a bronze medal in the men's 100m breaststroke at the World Swimming Championships. The Scot, 21, finished third behind England's Adam Peaty and Olympic champions Cameron van der Burgh at the touch in Kazan, Russia. After racing in 59.09, a Scottish record, he told BBC Sport: "I can't believe I got my hands on that world medal. "I'm the fastest I've ever been." Peaty clocked 58.52 seconds, with Van der Burgh just behind on Van der Burgh on 58.59. "I can't believe it, I'm so happy. It's just a state of disbelief at the minute," said Murdoch. "I just stuck to my race plan and everything went perfect." Meanwhile Perth's Stephen Milne has qualified third fastest for the men's 800m freestyle final.